It had been 46 days and 11 games since the Northwestern University men’s soccer team played a winning match. But Friday on senior night against Division III opponent Concordia-Chicago, the Wildcats ended that winless streak with a 6-0 beatdown of the Cougars in addition to honoring the squad’s six seniors. Head Coach Tim Lenahan knew, coming into the game, that his side would generate a lot of chances to put the ball in the back of the net. A win on the final day of the season means the Wildcats will finish with a 5-8-5 record overall, with a 0-5-3 mark in Big Ten play. It is Northwestern’s first winless Big Ten season since 2003. Northwestern circles up before its match against Concordia-Chicago. The win was the team’s first in 47 days. Defender Garrett Opperman launches a pass across the field. The defender finished with one assist on the night. Forward Spencer Howard attempts to split two defenders on his way to registering a shot. Senior defender Jake Roberge pokes a ball into the goal, the Wildcats’ first of the night. Northwestern celebrates a second goal by senior Camden Buescher, his first of the night. Midfielder Drew Viscomi attemps to bypass a Concordia defender as first-year Connor McCabe waits for a possible pass. Defender Garrett Opperman rises up for a header off a Northwestern corner, one of nine on the night. Forward Jose Del Valle watches the Wildcats’ third goal hit the back of the net. It was Del Valle’s second goal of the season. Midfielder Sean Lynch crosses a ball into the box for waiting attackers. Northwestern celebrates a fourth goal from midfielder Matt Moderwell. Northwestern extends its lead to 5-0 off Buescher’s second goal of the evening. Viscomi waits to fire a cross into the box as a Concordia defender watches the ball closely. Northwestern celebrates its sixth and final goal of the night. The goal from senior Camden Buescher gives him a hat-trick for the evening, with an additional assist. But the Wildcats’ victory added a measure of glory to the close of the season. Camden Buescher led the charge for Northwestern with three goals and an assist in his final regular season game at Martin Stadium. As a team, the Wildcats matched its goal output for the last 11 games with other goals coming from forward Jose Del Valle, defender Jake Roberge and midfielder Matt Moderwell. Buescher conceded that, after his second goal, he was absolutely thinking about picking up a hat trick on senior night. Buescher finished the regular season with six goals and two assists, contributing to a team-high 14 points. But Lenahan said plenty of other teammates played quality soccer over the course of the evening. Lenahan added that in addition to Mazzola, players such as first-year Connor McCabe and junior Sean Lynch made the game easy for the Wildcats and helped dictate what seemed like endless possession. 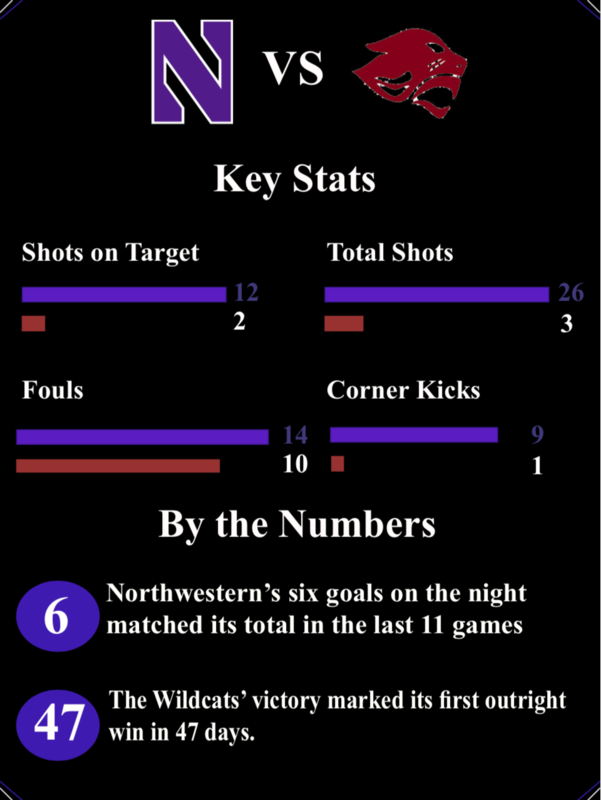 In addition to dominating the possession battle, Northwestern throttled Concordia-Chicago when it came to other statistical measures. The Wildcats took 26 shots on the evening to the Cougars’ three shots and had nine corners on the night while Concordia-Chicago had one. After the conclusion of the regular season, Northwestern will turn its attention to the Big Ten tournament, which begins Friday in Westfield, Indiana. As the number eight seed, the Wildcats will face the Ohio State Buckeyes, with the winner moving on to face top-seed Indiana University. The last time the Wildcats and Buckeyes matched up, the two sides played to a scoreless tie in double overtime. However, the Wildcats had a one-man advantage for most of the game as Ohio State received a red card early in the second half. For Buescher, he’ll know if it’s going to be a successful match based on one simple metric. Should the Wildcats win against Ohio State on Saturday, it will be Northwestern’s first two-game winning streak since early September, and the team would move on to face Indiana on Sunday.